Most of the flowers I like are the cool tones - the blues, the pale pinks and dark purples. Come September, however, golden yellow appeals. Shadows deepen in the rich green foliage. Flowers seem to soak in the sunshine that slants low in the clear afternoon light. Paper thin hydrangea blossoms benefit from this light, too. The pale blue of summer darkens to a richness that reflects the colours of harvest. Summer's end is here yet she loiters, not wanting to miss anything. We enjoy the sunset on our evening walk. Curtains are pulled against the darkness that falls earlier. Street lights wink on as we pass. Farewell, sweet Summer, welcome Autumn. I'll be linking to Mosaic Monday, hosted by Judith of Lavender Cottage Gardening. I spent sometime today cutting back all the spent flowers in my Gardens. Everything is pretty well finished now, only a few late roses left. There is beauty in it all. I always love how the yellows and oranges are so much more vivid in the fall. Your garden is beautiful yet. I am thankful to live in a place where there are seasons. Although I have my favorites, I'd not want to miss a single one. Fabulous photos - you capture the light and the season beginning to change perfectly. Your words read like poetry...lyrical and lovely. The flowers are really pretty and I love that they are in such a nice bloom. September is looking very nice in your garden and your description of the light at this time of year is also lovely. I loved seeing your gorgeous autumn garden pictures! Such a colourful time of year and always amazing light too. Such a sweet post my dear..
Beautiful. I too love the cool tones. But my little garden has already faded. Aspen leaves are turning and the cooler weather is on it's way. We can feel the cool in the air and know that autumn is in it's way...spent the day in the garden yesterday and filled in some bare patches with pots of fall colour. We have certainly enjoyed a beautiful summer. Your hydrangeas are so beautiful. Ours have now been eaten by the deer. That's a lovely picture of the tree--keep it in mind for Donna's tree challenge coming up! I like the contrast you created in the first collage. Although summer has delicately faded away I welcome autumn wholeheartedly. Thank you linking to Mosaic Monday Lorrie. The hydrangeas are so pretty. The yellows and oranges are so bright and pretty. Lovely booms. Pretty sunset shot to end your day.. Have a happy new week ahead! We were just talking about how much earlier the sun is setting and how shady it looks in the afternoons. I love hydrangeas...they are my favorite flower. Pretty fresh or dried! Enjoy your week! Hugs! What a poet you are dear Lorrie! The last lines on your post made me so very happy! Thank you for sharing such glorious images. If one could plant one plant for year round beauty it's the hydrangea. The flowers last forever! Hasn't this September been spectacular!!! So beautiful, Lorrie! The end of summer is a little bittersweet, especially the loss of long sunny days. I love autumn's colors --it is always my favorite time of the year. Hi Lorrie, we've been having the most amazing Sept here on the West Coast, haven't we? Loved seeing your flowers. Hope our weather lasts a little longer. Yes, tomorrow it will officially be Autumn. Where did the summer go? Lovely hydrangea. I cannot get them to grow here. Have a wonderful week. Oh Lorrie, this is why Autumn is my favourite season. The muted tones of your heavenly hydrangeas just takes my breath away, I do hope you dry some for winter decoration! The warm yellows of the daisies are so very attractive too, it's like the sun is hanging on as long as it can! I love the change of seasons which ever one it happens to be, but Autumn as she quietly creeps up on us with her muted tones is the one I love most! Nice to see you again, Lorrie. Love to see your autumn sunshine brightening up your flowers. They are so pretty!! So glad to hear that your daughter has a friend from Japan.The name of Asuka is very lovely!! I look forward to visiting your blog again. 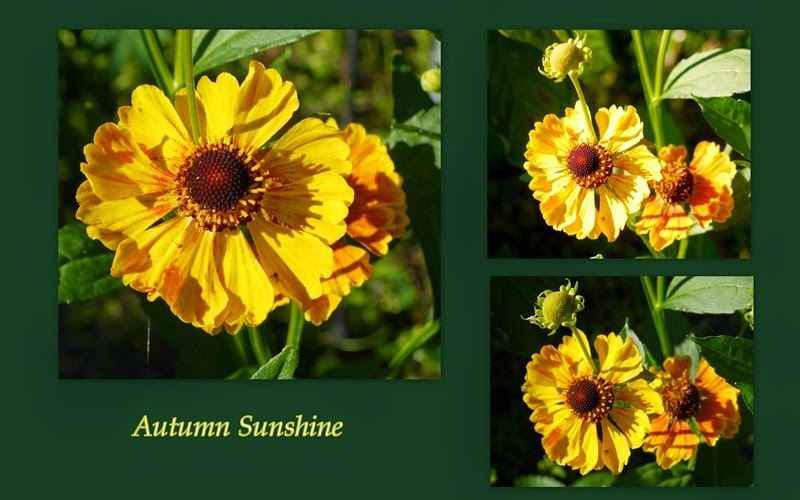 Beautiful thoughts on fall and lovely blooms...love helenium in fall too! Beautiful...a lovely send off to summer and welcome to autumn. 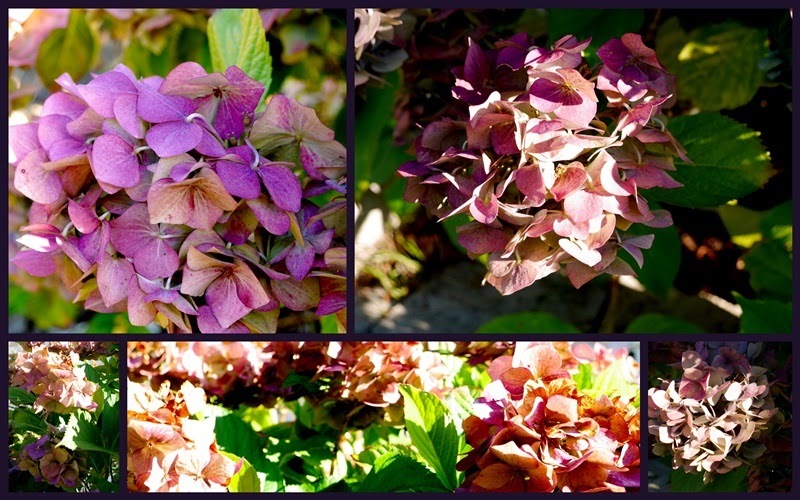 I love the fading hydrangea colours. Sad that summer has passed but autumn brings beauty of it's own! Pretty mosaics of your September garden, Lorrie. How brilliant are those golden yellows, indeed. Summer may be taking a bow, clearing the stage for autumn in your parts, but here in the Med, it is still the star! Tomorrow we're expecting 32°C in my neck of the woods, and another heatwave. Rain sure sounds refreshing, right now! Beautiful collages! I'm having a hard time welcoming fall this year, although it is a gorgeous day and our leaves are turning color. Summer seemed way too short. Isn't it amazing how the colors and light changes with the seasons? I love your illustrations of just this. Just lovely!